Discussion in 'Android Devices' started by EpicMyst, Sep 27, 2011. I bought this Epic ten days ago, and immedietly downloaded Automatic Task Killer and set it to everything except for AIM and Clock. Now, the battey that came with the phone was not lasting me that long. I had left home with 99% and by the time I got home it had depleted to about 35%. I used it for about 25-30 mins of browsing on lowest brightness, with 3G, wifi, enabled. I may have used 4G for like 5 minutes but it remained off the rest of the time. I also listened to some music for maybe 15 minutes. Yesterday I had got this battery replaced with a brand new one as I thought the battery was bad. I got it at 45% and squeezed out nearly 24 Hrs out of it but most of the time it was idle. I drained he battery completely and recharged to full with he phone off. Now, I left with the phone at 99% battery and with about 45 mins of use, and about a couple of hours of idle, its down to 65% (using the battery widget) I checked the "About Phone" battery thing and it says 4hr 39min. Now my question is that is my phone broken or something? Is the battery life suppose to be this low? I read people getting 30 hours off a single charge when I barely squeeze out 12! You should uninstall Automatic Task Killer. Pronto. Android 2.3.4 manages tasks on its own. Running a task killer will actually use more battery because it winds up killing benign background processes/tasks that aren't using any juice. Next, go into apps that use data, and update those app preferences to update less frequently. Go into Settings > Accounts to ensure that you're only syncing information that you care about. Do you have many widgets on your home screens? They all use juice... remove extraneous widgets so you only have those widgets that are most useful to you. Are you leaving 4G on all the time, or are you only turning it on when you are actively surfing / interacting with an app? Note that the stock browser has an independent brightness setting. While in your browser, go into Menu and set it to the lowest brightness. There are lots of android "battery tips" threads / articles out there. Those will offer alot of useful tips, and can really help extend your battery life. Not only that, but you have a built-in task manager on the Epic 4G Touch. A task killer is not only unnecessary, but redundant. EpicMyst and geekaren like this. Ah ok I will uninstall it. I was unaware that it did it on its own. As of this writing, I have Twitter, the stock clock, weather, Audiomanager, That bar with "Wifi, bluetooth, brightness, settings, screen timeout, etc", and silent toggle. Ill remove most of them except for the clock and toggle. I only turn 4G on mostly when I dont get 3G. It is mostly when I go to some places that dont get any 3G which is not more than maybe once a week. I normally keep brightness at around 50%. I turn it down to the lowest when I am in the dark. What do you mean by swipe on the the notification bar? I tried but nothing happens. I usually use the Opera browser since most flash vids and some websites I download things from work on it. Thanks so much for the help! I'll go make the changes you suggested. Unplugged1 offers a great point: If you want to manually close an app, just long-press on your Home key. It will bring up the phone's built-in task manager and you can kill a running app. EpicMyst and Kori_Tamashii like this. Neat, I didn't know it could do that. It's super handy for keeping screen display at low brightness indoors and then quickly setting screen brighter outside. So should I exchange my phone still or just go along with this current one? Wow! Is that with alot of usage? Since you've taken some steps to optimize battery life, why not charge it overnight and then see how your battery life is tomorrow? You still have a few days before your 14 day regret period ends. Ok I will do that. I'm on the verge of formatting the whole thing just to see if it's some app in the background then recharging and using it the whole day. I would call it light to medium. I made about two 10 minute calls, quite a bit of web surfing (including responding to this forum and Sprint forum. I received about 25 email, and replied to a few. Did some updates on the market. Downloaded a few apps, browsed the app store, etc. So I reset my phone to factory settigs and took off most wigets etc that you guys told me to and i started with a full charge and now within 20 mins of use i lose 11% battery. Mostly used in lowest brightness and downloaded zero things. Is this normal? I have to say it was constant 20 min usage though. 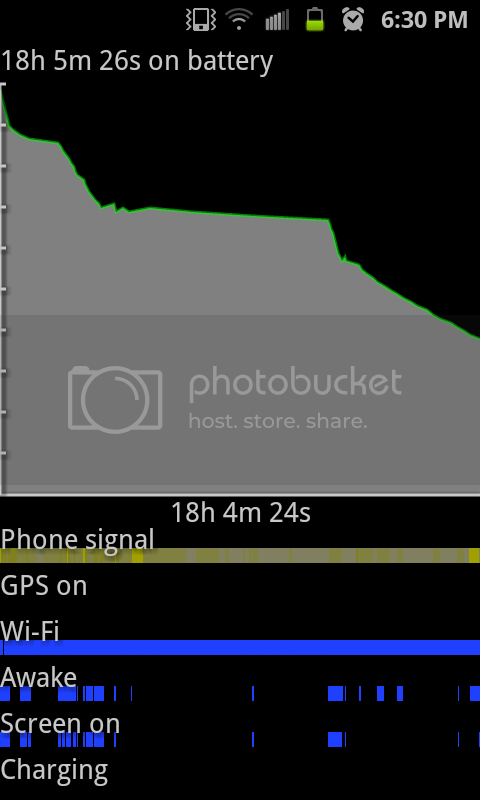 Go through your day normally, and see how your battery has done over the course of the day. First off, task killers are completely pointless and you have no need to install one on Gingerbread. Secondly, when i bought my phone from sprint they told me "whatever you do, dont download a task killer as it voids your warranty." so by you getting one you kinda messed yourself up. but i told them that the version of android the phone runs has a task manager built in. i dont know if there is a way for them to know what you installed, but thats just what they told me. a bunch of BS if you ask me. ....when i bought my phone from sprint they told me "whatever you do, dont download a task killer as it voids your warranty." . There is NO software that you can install on this phone that will "void your warranty." It was misleading and incorrect for any Sprint employee to suggest that any software can have an affect on warranty. If the statement by a misinformed employee actually had substance, any owner/customer could easily take care of the issue with a factory reset. yeah i thought it was pretty funny they were trying to tell me stuff that was completely implausible. but for someone that is new to Android and doesnt know that the sprint people dont really know what they are talking about, it could be a real problem. but like everyone has said a factory reset ususally solves problems. thats sprints go to fix for everything. EpicMyst and unplugged1 like this. ... but like everyone has said a factory reset ususally solves problems. thats sprints go to fix for everything. Yeah, that bugs the heck out of me. You come into the store, say that there is an issue with Google Voice or maybe the power button seems loose, and the first thing they say is, "Well, we'll have to do a factory reset to test out the problem." Ok so I've used it since last night mostly between lowest to 40% brightness. I left it on all night. I literally didn't download anything except for AIM onto the phone since the rest. I took off all the widgets on the home page that I didn't need. The battery is at 37% right now. Mostly listened to music, read some manga on the browser, and did youtube. That seems like pretty good battery life to me. Are you feeling more comfortable with your battery life, based on how you used the phone today? Comparatively, yes. I was surprised last night when I kept the screen on while listening to some music for a while (about 20 minutes or more straight) and the battery only dropped like 4%. Thanks again, geekaren, helped tons! Edited to add: When I bought my 1st android phone, the sales person took several minutes to walk me through ways to optimize battery life. Most phones are sold with most apps set to sync frequently, lots of data-intensive widgets loaded on home screen, etc., so I don't think most new users realize how much battery life those "default" items use!! There's definitely a learning curve. EpicMyst: I'm still concerned about the relatively high OS use you are getting on your phone. I would think that it would be more balanced than the showing of 72% OS over an 18 hour period. Does anyone else show a similar imbalance on their Epic 4G Touch? That was indeed strange. The only thing that comes to mind is that I used the stock browser, not sure if that counts as Android OS. Thanks toons to you too, unplugged! I also got the phone replaced so here is hoping for decent levels.